His Highness, Prince Pickerel of The Secret Garden, has returned to his summertime throne. 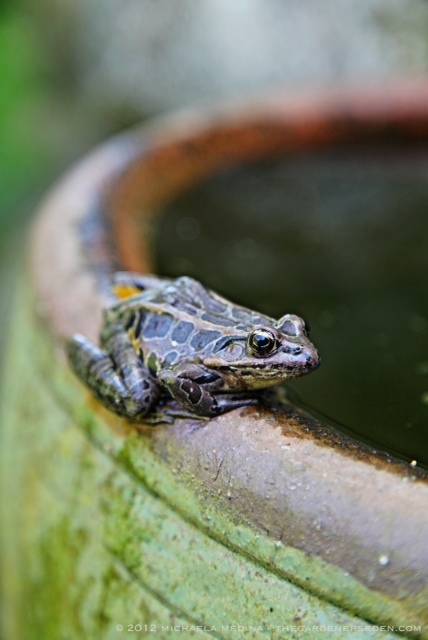 You may recall earlier mentions of this copper-clad charmer from summers past; particularly this post on the pickerel frog, from August 2010. Welcome Home! All Hail the Prince! § 5 Responses to All Hail the Prince…"
It’s pretty cool when the creatures feel at home in our domesticated spaces. Welcome back, Pickerel Frog! My family had a big old toad who lived in our mud room every spring and summer. It always felt like a relief to see him return. You are currently reading All Hail the Prince… at The Gardener's Eden.